This will be Shari Clarke’s third year volunteering with Symphony Nova Scotia. You will find her throughout the concert season helping out at the boutique in the Cohn lobby and attending as many performances as she can manage. “This volunteer work is one of the most wonderful things I’ve done. I really feel like part of the Symphony family,” she says. Originally from Toronto and after studying music at McGill, Shari has called Halifax home for 20 years. A former music teacher at the Shambhala School, she now works at repairing string instruments. Her love of music has her continually involved with all kinds of community activities. She had been a volunteer usher with Tafelmusik in Toronto from their very beginnings back in the early ’80s. Along with her current commitment to the Symphony, Shari now volunteers as an usher with the Aeolian Singers and as a performer singing with her guitar in local hospitals, nursing homes, and senior residences. Shari has also participated in the Lunenburg Boxwood Festivals for the past four summers. 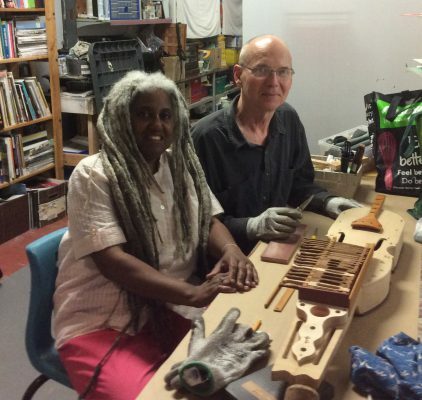 Shari’s most recent passion has been the construction and crafting of a pair of nyckelharpas. The project was an 18-month collaboration with her good friend and fellow Symphony patron, Christopher Purcell. 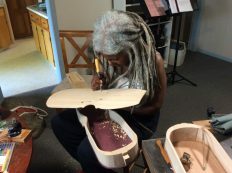 Her fascination with the instrument began in Cape Breton, three years ago. “I was at a Celtic Colours concert and a small group performed onstage with a fiddle, a guitar, and a nyckelharpa. It was the first time, I’m sure, that many people there had seen or heard a nyckelharpa. You could hear the gasps in the audience and they were just mesmerized by the sound. There has recently been a resurgence of folk music with nyckelharpas in Sweden, Norway, and the U.K., but that was the first exposure for people in Nova Scotia. “When I came back to Halifax, I told Chris all about the concert and showed him some pictures of the instrument that I found online. I researched a bit more and subsequently found out that as recently as the 1980s someone had built a nyckelharpa in Canada, but no others since. There were nyckelharpa kits available to buy in the States, but I knew the only way I was going to have one was to build one. 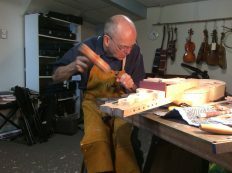 “Prior to this project, Chris and I worked together over several years repairing violins, cellos, and a few small lap harps. It took a bit of convincing with Chris to try this. We knew it would be a huge task and he thought it might not be possible given the complexity and the amount of time it would take to complete. We watched a few more YouTube clips and I gradually won him over. “So we ordered a book with plans and instructions. It was written in English by a Swedish builder. We also found an instructional video online by the same author but it was completely in Swedish. We started with selecting the wood. The instruction book listed the best kind of wood to use for each part of the instrument. 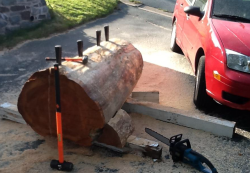 The bigger pieces required hardwood so we went to a wood lot in Sackville and selected a hemlock to begin the work. “Planning and strategizing about the building project was something new to us. We really had to think about taking it step by step and it was a blending and exchange of skills. Neither of us could have completed this project without the other. “We generally spent about four or five hours a week on the project over 18 months. The biggest challenges were dealing with the unknowns – working on new pieces with each step, sometimes with tools we hadn’t used before. We worked with band saws to very fine files and everything in between. There were times we made mistakes and had to start individual pieces over again. “Most of the work on the big parts was done in Chris’ garage and smaller pieces I could work on in my living room. We also did a lot of the work at Wonder’neath, an open art studio on Isleville Street. We brought the book with us and worked on the smaller parts of the instrument. There were always lots of children coming and going there. They helped us with the work and at the same time learned about the nyckelharpa. It was great for them to see it growing in stages. 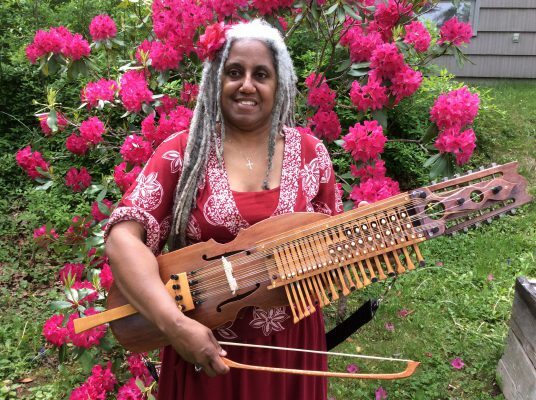 Once completed, the first public concert for the nyckelharpa was at the end of June at the 2017 National Fiddling Day in Rawdon, Nova Scotia. Over the summer, Chris and Shari have introduced the new instruments to the Irish Sessions in the Lions Head Tavern here in Halifax. They report that people are very curious about them and ask a lot of questions after seeing and hearing the nyckelharpas.